It has been a rather eventful month in Mentawai – gathering documentation for a campaign video; furthering our strategy to enable the community an avenue to sustain their cultural education program; and meeting with Mentawai Government heads to discuss their level of support and collaboration. We also had a visit from Australian photojournalist, Chris Hopkins. 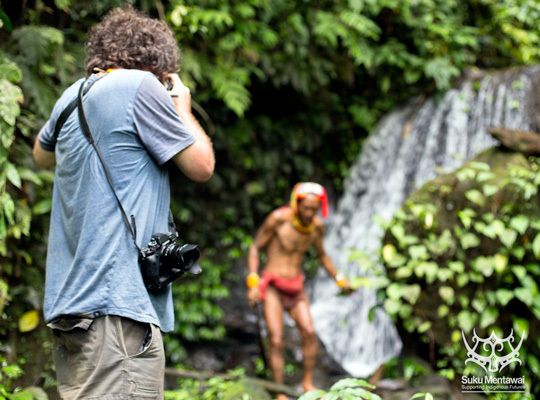 Our campaign video, featuring verbal/visual content from a variety of Mentawai people and landscapes, will be launched early next year. As will a collection of Mentawai photographs captured by Chris. Other exciting developments surrounding this campaign will be announced a little closer to the launch too, so keep an ear out. Alongside the program, Suku Mentawai has been working on a new eco-friendly, responsible tourism system for Siberut’s popular cultural-based (trekking) tours. This is particularly important for a number of reasons; one being for the program’s financial stability, and another because the current system is broken – providing very little (long-term) benefit to the broader community and/or the very attraction itself! After spending a few weeks on Siberut discussing ideas with all relevant parties – gathering information from each regarding their primary wants and needs – we made our way over to Tuapeijat (Sipora Island). Here, we attended the Mentawai Tourism Department’s master-planning proposal/discussion event, before later heading to Padang for a West Sumatran tourism workshop. 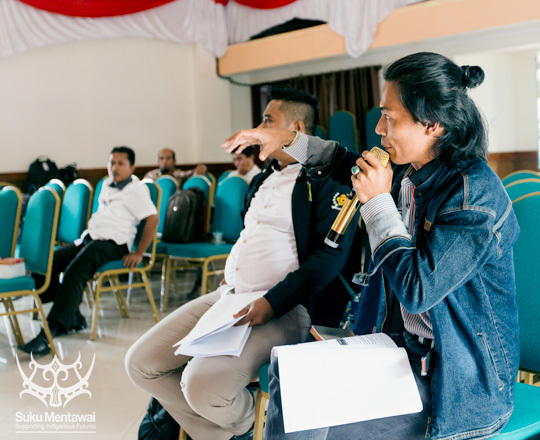 Outside of these events, we organised meetings with the head of Mentawai tourism, Ibu Desti Seminora, and deputy, Aban Barnabas Sikaraja, to discuss our proposed strategy. It went well. They were grateful for our commitment toward an area of tourism they’ve had limited resources or budget to amend. We have their full support and collaboration. Full steam ahead. 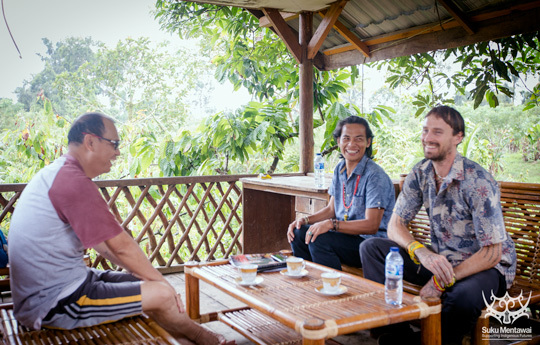 The next task was to meet with the head of Mentawai Government (Bupati), Yudas Sabaggalet, to present the Suku Mentawai ‘Cultural and Environmental Education Program’ (CEEP). This was proving rather tricky, as he is extremely busy at the moment with an upcoming election. However, fortune does favour the persistent and soon enough we received an invitation to discuss this at his home. Notably, Bupati spoke about Mentawai culture with great pride and enthusiasm. 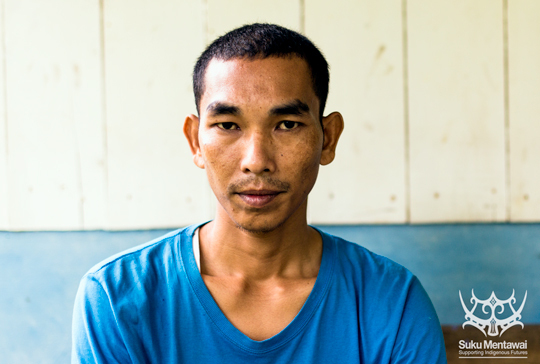 He was raised in Madobak village (Siberut – Sarereiket) and has many Sikerei within his family – some still living. 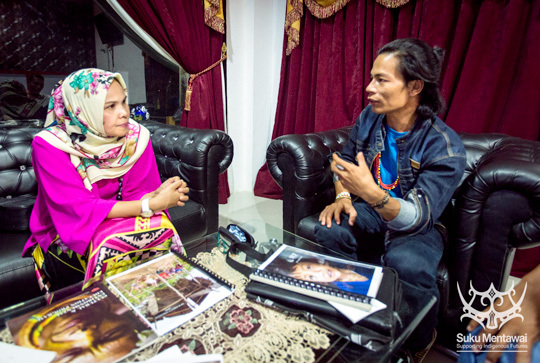 His connection to Arat Sabulungan culture feels strong, which is heartening and indeed helpful. The discussion was lively and our proposed CEEP well received. Bupati agreed that this current generation (and many of the previous) have lost touch with Mentawai culture and holds deep fears for the prospect of this happening to yet another. He gave us his full support and a verbal commitment to contribute funding and/or provide a pathway to generate such from within Indonesia. This is an enormous step forward, both for the program and for Mentawai. I’m heading back to Australia this week to finalise campaign/program partnerships and prepare the launch of our feature film – As Worlds Divide. Meantime, the local team continue to push the project forward here in Mentawai. All going well this CEEP will be underway by mid next year. It really is an exciting time to be involved. Please continue your support. Thank you.